Telephone: +44 20 7321 2535. Ascend the 238m-high (776ft) N-Seoul Tower, a viewing spire conspicuously situated atop landscaped Namsan Mountain, for an unparalleled vista of Seoul's majestic cityscape. It's especially beautiful at night, when the tower is lit up. Appetites can be satisfied at the N-Grill, the tower's revolving restaurant. Travel to the Hallyeo Maritime National Park in the southeast for a cruise around the archipelago, dotted with 400 islands. This is where Admiral Yi Sun-Sin (an Admiral Nelson-like figure) defeated the Japanese in the sea battles of the 16th century. Hire a bike and pedal the well-marked trails for the best of the seascapes. As one of Seoul's largest suburban areas, Suwon has all kinds of things for the tourist to enjoy. The UNESCO-listed city walls and defences of Suwon City and Hwaseong Fortress are among of the most famous sights, but nightlife is another of its big draws. Try the fiery hot seafood broth Jjambbong – and make sure your hotel has a bidet. This revitalisation project was quite controversial and cost Seoul taxpayers dearly, but this river (which was once a sewage trickle beneath the pavement) is now a lengthy walking area with art exhibits, performances, sculptures, and even make-out spots for lovers. The Candle Fountain is popular highlight after dark. Visit Korea's 'museum without walls' at Gyeongju, near Busan. The capital of the Silla Kingdom for 1,000 years, it is packed with history and Buddhist culture, all designated by UNESCO as one of the world's 10 most historically significant sites. After exploring the city, take in the best history museum in South Korea, Gyeongju National Museum. The Seorak mountain range is considered to be the most beautiful landscape in the whole of South Korea, and with its austere pinnacles of rock, its verdant forests, rushing spring streams, waterfalls, and temples, it's got everything a hiker might want to see. For trails over a day long, a guide is recommended. For winter sports, head to the Alps Ski Resort or another of the 13 ski resorts within four or five hours of Seoul. The city of Pyeongchang has plenty of powder, such as the excellent Dragon Valley (Yongpyong), and will host the 2018 Winter Olympics. Odaesan National Park is also famous for its off-piste action. Learn about South Korea's Buddhist heritage by experiencing the serenity and sanctuary of a temple. The country has over 10,000 temples and 20,000 monks and visitors can even stay at some of them, practising meditation, lantern making, tea ceremonies and simple elements of Buddhism. Whether you hike, birdwatch or rock climb, check out relics and visit the temples and fortress in the mountains of the Bukhansan National Park. They are some of the most favoured in South Korea, and they're not far outside Seoul - they even have their own stop on the underground. See the sights of Seoul: Changdeokung is an exquisite Joseon palace and its picturesque Biwon (secret gardens) are enchanting but can only be visited with a guided tour. Nearby Jongmyo Shrine contains ancestral tablets of the Joseon Dynasty. The huge National Museum of Korea is architecturally and culturally fascinating. Join in the Korean love of theme parks by visiting Lotte World in Seoul as well as the outdoor attractions of Magic Island, which features one of the world's largest indoor theme parks. Else, head an hour outside the capital to the vast Everland leisure complex, which boasts the Caribbean Bay water park, Hoam Art Museum and even a zoo. Jump on Korea's pride and joy, the KTX high-speed train, launched in 2004 and capable of travelling at 300kph (186mph). 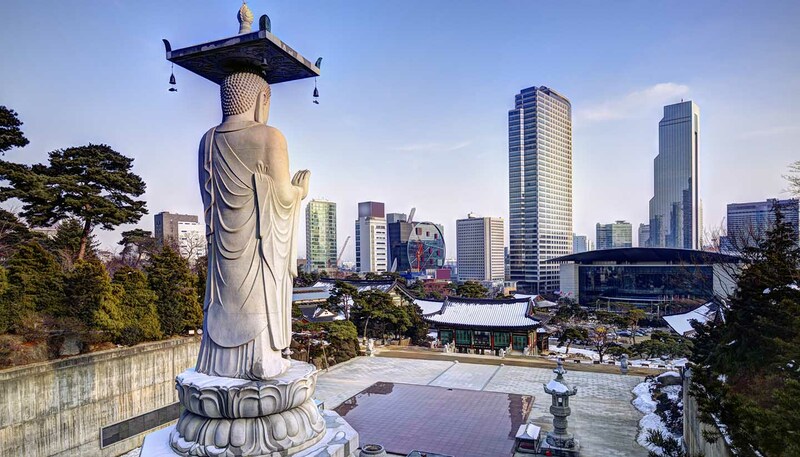 Take it to the bustling port of Busan to see Jagalchi Fish Market (not for the squeamish), Busan Tower and the 1,300 year old Beomeosa Temple. In Yongin, about 45 minutes south of Seoul, this excellent folk village is where you can meander through live demonstrations of various traditional Korean arts, crafts and games, and see how buildings were made centuries ago. Fun for all ages and interesting to boot, this living museum is a must see. Soak up the wonderful atmosphere of Bulguksa Temple. This large wooden temple is beautifully painted and the stone Dabotap features numerous cultural relics. A winding road high on the mountain above leads to the Seokguram Grotto, with the magnificent granite Buddha looking serenely down through his protective glass case. Set in the idyllic Gayasan National Park, Haeinsa Temple was originally built in AD 802. It eventually reached its present-day size during the mid-10th century and is famous for housing the Tripitaka Koreana - 80,000 wooden printing blocks carved during the Goryo Dynasty. The temple also houses a great number of artefacts including the Seated Stone Buddha and Stone Pagoda. Korea's 'Hawaii' is just off the southwest coast and it features Mount Hallasan, Korea's highest mountain at 1,950m (6,400ft). Atmospheric 'stone grandfather' statues (made from black lava) can be found all over the island, alongside spectacular waterfalls and impressive volcanic scenery. Go underground and marvel at the Manjanggul Lava Tubes or greet the dawn at Seongsan Ilchulbong Peak.